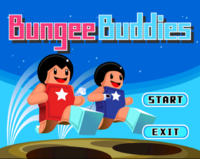 Bungee Buddies is a multiplayer minigame in WarioWare: Smooth Moves. It allows two players, each of them using a Mii as their avatar. Each player takes the role of one of the two Bungee Buddies. One player holds the Wii Remote to their hip, while the other holds a connecting Nunchuk to their own hip. The objective of the game is to avoid obstacles on the road by physically jumping (while always keeping the controllers at their hips) and trying to reach the farthest amount of yards. Landing into obstacles will slow down the player's progress, while getting cake will speed it up for a short period of time. After one minute, the game tallies the total yards and shows the compatibility of the two players, after which they perform a pose as shown by the game. This page was last edited on April 5, 2018, at 13:09.